Titchwell is a small parish on the north coast, close to the town of Hunstanton, and the small village straddles the main road along the coast. Titchwell comes from the Old English meaning ‘spring or stream frequented by young goats’. The archaeology of the parish dates back to the Upper Palaeolithic period when the parish was far inland from the sea. An important example of an occupation site (NHER 15352, 22810) dating from the Upper Palaeolithic has been found on the coast at Titchwell. A number of Upper Palaeolithic flint implements were recovered from the beach over several years, and other flints were found in situ beneath a deposit of peat that was only visible at exceptionally low tides. The material recovered from the beach indicates that people were producing flint implements here in the Upper Palaeolithic period. When in use the site was at some distance from the coastline, and was situated on an open, inland site, possibly close to a river. Other Upper Palaeolithic finds include flint flakes (NHER 1353, 20895), a handaxe (NHER 1355) and an Upper Palaeolithic or Mesolithic blade (NHER 41448). There is more evidence of prehistoric activity in the parish. The cropmark of a possible prehistoric oval enclosure (NHER 17738) has been recorded from aerial photographs, and a number of prehistoric finds have been recovered including Mesolithic flints (NHER 1353), a Mesolithic or Neolithic stone mace (NHER 31137), Neolithic flints (NHER 1356), axeheads (NHER 14932, 36281) and arrowheads (NHER 36281). A Bronze Age ring ditch (NHER 26796) is visible as a cropmark on aerial photographs. On the coast a large deposit of peat that was formed in the Bronze Age (NHER 1354) has been exposed between Hunstanton and Brancaster. Small tree trunks, roots and branches from a Bronze Age forest can be seen within the peat. 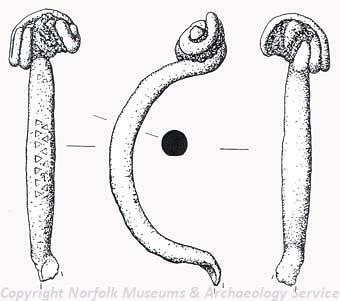 The only Iron Age artefact from the parish is a brooch (NHER 41158) that was found by a metal detectorist. The cropmarks of a possible Roman enclosure and linear features (NHER 26755) have been recorded, and fragments of Roman pottery (NHER 1322, 15868, 18500), coins (NHER 1357, 1358, 15868, 36678, 41158, 41159, 41160, 41898) and a brooch (NHER 41159) have been found. A number of possible Saxon features have been identified from aerial photographs. They include linear features, pits, possible enclosures and a trackway (NHER 26745). Fragments of Late Saxon pottery (NHER 1389, 15868, 15870, 19634) and a stirrup terminal, strap-end and stirrup-strap mount (NHER 41158) have been found. The Domesday Book records Late Saxon Titchwell as a fairly substantial holding. It was an outlier of a royal manor, and had a mill and over two hundred sheep. St Mary’s Church (NHER 1389) has a 12th century round tower, a 15th century nave and chancel and a late 19th century porch. The chancel also dates to before the 15th century, and a splayed window dating to the 12th century has been uncovered. Inside there is a 14th century piscina, a 15th century rood screen and a mid 18th century wooden font. A 15th century stone cross (NHER 1359) stands on an earthwork mound to the south of St Mary’s Church. The Rectory (NHER 18221) was an early 19th century Gothick-style house that was demolished in the 1930s. The earthworks of post medieval ridge and furrow (NHER 26786) have been recorded on an area of reclaimed salt marsh. In 2000 a layer of clay and peat was exposed on the beach bearing the marks of plough furrows dating back to the 17th century when this area was reclaimed for agriculture (NHER 37324). The peat was still visible in 2004 during the Norfolk Rapid Coastal Survey. The earthworks of several post medieval sea defence banks (NHER 26790, 26783, 26791) have been identified from aerial photographs. During World War Two the coast of Norfolk was heavily defended against the threat of a German invasion. Aerial photographs taken at the end of the war show the high concentration of World War Two defences along the coastline, including pillboxes (NHER 15558, 18069 to 18074, 26792), a bunker (NHER 18075), other military buildings (NHER 18076, 32409), beach scaffolding (NHER 26713, 41447, 41450), bomb craters (NHER 26779, 26782), a military training site (NHER 26789), a minefield (NHER 26785), an Armoured Fighting Vehicle practice range (NHER 26780) and a bombing range marker (NHER 26784). The remains of two World War Two tanks (NHER 43974) are visible in Titchwell Marsh. The Royal Tank Regiment used the marshes as a practice range during the war. A B24 Liberator crashed in the parish during World War Two (NHER 13685). Sarah Spooner (NLA), 24 August 2006.